We still have good conditions. I fear things are going to fall apart before the end of the week. Everything is being groomed today with hopes of trying to hang on for one more week. The trails are hanging in there! There is a warm-up looming in the next few days. Too early to tell what it’ll do to trail conditions. We are going to continue our normal grooming as long as temps and snow depths allow it. All the trails in the area are still in great shape! Enjoy them while you can. It’s been quite a while since the trails have been decent in March. There is a lot of ice underneath the snow. Be careful in the corners and watch out for the other guy! We did get a fair amount of rain on Saturday and Sunday. Initial reports suggest that it didn’t really kill all the snow because a thin layer of ice developed on top of the snow. Hopefully, that will be a good thing. We have a crew going out tomorrow to put together a comprehensive assessment. With the wind, I’m sure there is probably some trees and/or branches down on the trail. There is also some sizeable water puddles. The temps should be low enough to get things frozen up and some snow later this week could help get things in shape for next weekend. The trails are still in good condition. The snow base is taking a beating, the ice underneath is still there and you’ll need to be careful in the corners. We have not received any new snow this week. The warm-up coming Friday mid-day could put a hurtin’ on the trails as it is supposed to last through the weekend in addition to a pretty good chance of some rain. We are planning on grooming tonight [Thursday] with the hopes of keeping some of the ‘snow’ base through the weekend. I’m not real confident on that but, we gotta try something. Temps go back down after Sunday with a couple teases for new snow throughout the week. Fingers crossed. Keep Dancin’. Get out and ride! Groomers are running often. There is a little new snow in the forecast mid-week and a slight warm-up at the end of the week. Snow = Good, Slight warm-up = Not so Good. 8″ to 10″ of snowfall have put us back out on the trails. 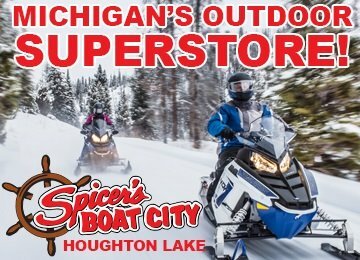 Our Groomers have reported Good to Excellent conditions for the Houghton Lake section of our system. The Roscommon section is scheduled to be groomed today. There is still a very thick icy base underneath that could become problematic after a few hole shots in any given area, especially going through corners. Today’s slight warm up could be helpful as long as the liquid precipitation is kept to a minimum. A little moisture in the snow will get our snow base to tighten up and really give us something to work with and possibly give me the confidence to upgrade the trails to excellent. All area clubs are out grooming as well and I’m confident their systems are in very good conditions too! Thank you to everyone that participated in our Snow Run last Saturday. It was a successful event and everyone had a great time. It’s all good! All the snowmobile trails in the area are in great condition. I would suspect these conditions will last through Saturday. There is a warm up forecasted for Sunday and Monday including a high in the mid 30’s for Saturday. This and the chance of rain in the forecast could make a mess of the trails. The extended forecast suggests things will turn back around early next week, at least in terms of temps. We are all set and grooming regularly. There is a big storm heading our way and hopefully it’ll set us up with EXCELLENT conditions. Check out our facebook page for all the details on our 17th Annual Snow Run. February 9, 2019. Better late than never! The snow is falling and we are putting plans together to get out grooming, possibly as early as tonight! We have a very icy base with a few inches of snow on top of that. If the new snow will stick good to the ice things will be great. Watch out for icy corners and ice chunks where the water holes used to be. We will be doing our best to get them filled with snow as long as it keeps coming! The temps and the forecast are in our favor for over 15 days. No reason to stop dancin’ now! Please be watchful for wheeled vehicle traffic out there on the trails, all traffic for that matter. STAY on the RIGHT side of the trail and ALWAYS assume that someone is coming around the corner and may be on the wrong side of the trail. In our area, the snowmobile trails are a shared trail. 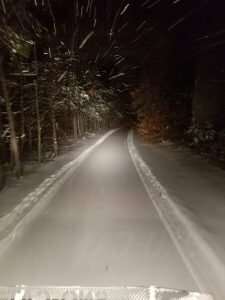 Meaning wheeled traffic could be encountered, even on a groomed snowmobile trail. 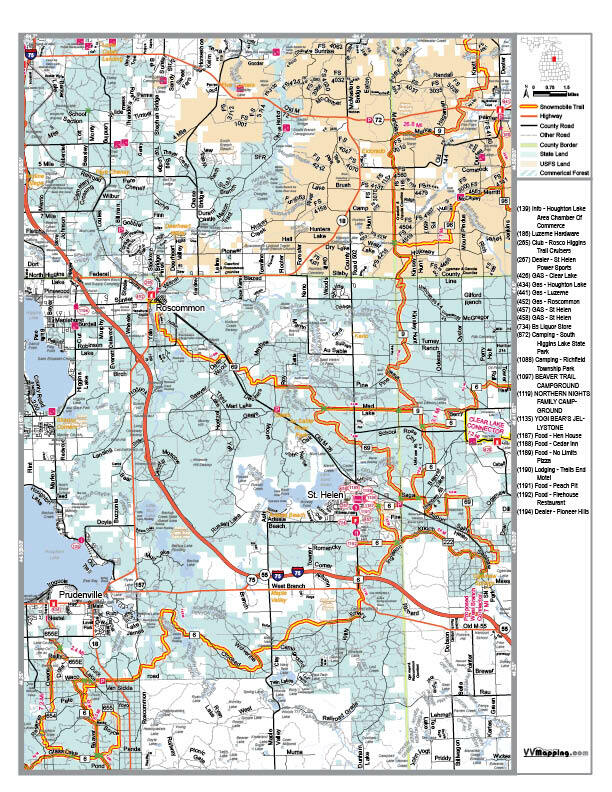 At the request of the DNR/PRD, and MSA, If you see damage that has been done to a groomed snowmobile trail, anywhere in the state, by wheeled vehicles, please take pictures and send them to us via private message or directly to one of the agencies mentioned. Thank you. Mark your calendar for our Snow Run on February 9! check our our facebook page for details. There is a link below. 1/20/2019. Poor to Fair, looking up! Things are heading the right direction. The icy base is our saving grace to being able to ride at all. We had roughly 1″ of snow on Saturday and with that I’d call the conditions ride-able. There is some more snow in the forecast for this week and if we even get a few inches the trails will be in respectable shape for what it is we’ve been handed this season. The groomers have not been out since the first of the year because of the lack of snow. If we get some accumulation this week we will most likely do some grooming. Our 17th Annual Snow Run is coming up! February 9, 2019! You can find details on our facebook page. St. Helen Snowpackers Facebook page. The best thing I can say is if we ever get any snow and it stays cold, the water holes will be frozen up. Our ‘so-called’ base is ice. We are on course for what could be the worst winter ever. Our Snow run will happen regardless of snow conditions. The check points can be reached by car or pickup as they are at road crossings. Save the date – February 9, 2019 for the snow run. See our Facebook page for more info. St. Helen Snowpackers Facebook page. 1/4/19. Poor and getting worse. This warm-up is going to put a hurtin’ on the trails. We anticipated it, as did the other clubs in the area. The intention of grooming this week was to create a base that may stand up to a bit of a warm up. Fingers crossed. The forecast suggests that things will swing back in our favor next week. I’m sure you can ride out there, and many will. You will likely find a few water holes with ice chunks and some slushy areas. 1/3/19. Better than poor, but not good. Things are looking up! By the end of today we will have our system panned. The Roscommon route was panned last night with a basically good report with the understanding that it’s still like early riding conditions. The base is just too thin. Despite the forecast stating warmer temps, the method to our madness is the at least try to build a base that will stand up to a little warm up. The down side to this is the possibility that wheeled vehicles will undo the effort we’ve put into that. 1/1/19. New Years Eve blessed us with a few inches of snow. We are considering starting to build a base by panning. However, I’m certain there are a bunch of water holes out there. With any luck we can at least start a base with the help of the colder temps to help set it up over the next couple days. Fingers crossed. Keep Dancing! 12.27.18 No Snow. No Change. We haven’t even left the barn with a groomer. Colder temps and a few chances for snow in the next 10 to 15 days will hopefully play out in our favor. 12.7.18 Unrideable. Technically the trails are open, but WE NEED SNOW!! The club has completed all required brushing, signing and graded as much as we could to smooth out the berms and bumps left from the ORV season. The temperatures have basically been favorable to get the ground frozen which is a good thing. We need a nice 8″+ system snow to get us set up to start panning.